Is there a civic education in Bulgarian school today? This study is part of the collective research project “Nation and Citizenship.” Its specific target is to analyze the recent Bulgarian State Educational Standards regulating the school education from the 1st to the 12th grade in the field of “Social Sciences and Civic Education.” Under research are also the curricula of the school disciplines as well as the textbooks for the 12th grade (in the so-called “World and Person” individual discipline). The analysis demonstrates that the State Educational Standards retell as clichés old “dialectic” Hegelian and Marxist figures such as the “unity of individual, particular and universal,” “consciousness of necessity,” “progress,” etc. But in these recent usages the telos of the world history is replaced and, instead of the “enlightened monarchy” or “communism,” now it represents “democracy,” “European values” and “human rights” as an End in itself. This mechanistic meaning replacement in the centre of “the story” enervates the distinctive power of all contemporary “civic” concepts and leaves them operating in a regime of synecdoche, where everything is everything and nothing is the same. The synecdoche continues to work arbitrarily in the curricula of the disciplines as well as in two of the three textbooks for the last discipline in 12th grade – “World and Person” discipline. Therefore, the normative framework of civic education in Bulgaria today is absolutely simulative. All good practices that exist in Bulgarian civic education run against or beyond the official frame. This general conclusion is drawn against the background of a briefly sketched interactive concept of citizenship which is constitutive of democracy. This concept is based upon family resemblances between different contemporary theories (those of Arendt, Offe, Ranciere, etc.) and presupposes a permanent tension between the individuals and the state as active sides in the contestation and renegotiation of the institutional framework of citizenship on the basis of different and competing models – for example, republican, liberal, multicultural or else. The paper presents research findings generated by nine focus group discussions with teenaged pupils (9th through 12th grade) in seven Bulgarian cities within the framework of the “Nation and Citizenship” research project. The fieldwork was carried out in the period between November 2009 and March 2010, and the interpretation aims at disclosing the vocabularies of the everyday political philosophies upheld by the interviewed. Not surprisingly perhaps, no significant use of the term “citizen” or of its derivatives could be found in these vocabularies. At the same time, there is a pronounced critical attitude toward the “state” understood as a machinery for the generation of order. It is order that is normatively valorized and, at the same time, experienced as missing. And strangely or not, it is not the concept of citizenship but the concepts of motherland and the people that play the role of everyday social criticism. “The people”, besides, is conceived in its high connotations as the simple, the non-qualified and the undividable, and that precisely is what shapes the features of the nationalism articulated by the interviewed: it is rather a mystical than ethnic nationalism used to criticize power when it seems illegitimate but intangible at the same time. And it is the mystic character of this nationalism that accounts for the easy transmutation of the demos into ethnos. The aim of the research paper is to gather and analyze the traces in writing left by children and teenagers in the late socialist times – with an emphasis on the so-called lexicon (album, Freundschaftsbuch) and the memory book; to follow how the child and the adolescent utter themselves, how they construct their identity within the two mentioned unofficial genres on the verge of the private and the public; to outline the problematic authenticity of their story between the banality of the ideology and the cliches of the popular culture. The paper traces how the informal private language of the lexicon and the totalitarian public language interfere or coincide, and how in the institutional field of force and despite the social roles assigned to them, the child/adolescent finds shelter in the lexicon. The second part of the project and the second point in time include gathering and analyzing short interviews with owners of lexicons in order to find out how they regard their “lexicon experience” from the distance of two or three decades and in a totally different context. The article tries to explore the notions of power and order of high-school students by means of two alternative hypotheses. On the one hand, it posits the idea that the student would contest the regulation and discipline and try to surmount them because of his or her socialization in a disordered society. On the other hand, it assumes that the student would search for more regularity and measure of repression in order to stabilize his or her living conditions and to change the total violation of laws. The research shows that, through their critics to the state institutions, the young, being a traditional corrective of society, paradoxically express the desire for more regulation to be imposed by the same institution that they criticize. The paper argues that Benedict Anderson’s definition of the nation as an imagined community does not work for the contemporary Bulgarian society. Bulgarian citizens have a strong national identity, which is alien to the nation state. On the basis of the analysis of different research data (research on the most important topoi of memory of the Bulgarian citizens; focus group discussions with history teachers), the author defends the thesis that the national identity of the ethnic Bulgarian is based on the imagining of an abstract Bulgarian state, resembling the strongest periods of Bulgarian statehood in the Middle Ages as well as the dreamed one after Bulgarian liberation from Ottoman rule. This national identity is compensatory, it expresses longing for strong statehood with a strong leader, and imagines an abstract territoriality with no fixed boundaries. Being a “citizen” of this imagined state alienates people from civic participation here and now, and strengthens their nihilism to the present-day state institutions. The essay outlines the author’s methodological and theoretical premises in studying institutional and ideological transfer and exemplifies this approach by surveying several characteristic instances of transfer of liberal ideas and institutions in the Balkans in the course of the 19th century – the constitutive period of modern statehood in the region. The paper applies the conceptual history paradigm with an accent on the variable uses of the concepts “people,” “nation,” “nationality,” and “citizen” to the discourses of the 19th century prominent Bulgarian writers and political journalists Georgi Rakovski, Petko Slaveykov, Ljuben Karavelov, Christo Botev. The analysis reconstructs the 19th century polysemic status of “citizen” in a variety of political attitudes and causes: as a noun or predicate it could equally mean “townsman,” “layman,” “civil”/“civilian,” “civic,” “political,” “social,” “public,” etc. This way “citizen” could not concentrate into a semantic focus that enables strong political identifications even in the 19th century revolutionary discourses (this makes the traditional idea about the direct impact of the French revolution and its language on the Bulgarian 19th century national movements problematic enough). On the contrary, concepts like narod (which could mean both “people” and “nation”) and narodnost (nationality) proved able to concentrate all kinds of political platforms, identifications and activities. This constellation of “weak” terms (“citizen,” “civic”) and “strong” terms (“narod,” “nation”) proved consistent even after 1878 and affected the first major political documents of the independent Bulgarian state, as well as the language and political identity of the new institutions. In the first years after the establishment of the modern Bulgarian state in 1878, the first Bulgarian political parties – these of the “liberals” and of the “conservatives” – emerged by claiming to represent two different visions on the state’s development and welfare. The conservatives defended the idea of gradual and consistent preparation of the folk for the adoption of the modern European citizenship through a government of experts, while the “liberals” appealed for giving total freedom to the common people. Analyzing their legitimization strategies in various public discussions and journalistic writings, this paper shows how, beyond the heated speeches of ideological rivalry, the two parties reproduced one and the same dichotomy of corrupted “individuals” vs. uncorrupted “people.” Thus, the striving for property, social prestige and, above all, for high positions in the state hierarchy was perceived as a threat to the equitable distribution of national wealth. The implicit presence of this dichotomy in the Bulgarian political thought from the end of the 19th century onwards explains the electoral victories of the liberals as well as the prevailing of populist concepts over the rational debate on the national representation and the forms of government, which impeded the successful recognition of the important social functions of the state elites. The work deals with a specific problem in the study of Bulgarian history and law: the formation of Bulgarian legal culture in the period of transition to modernity. This theme is not among the ones which have attracted historians’ attention and it has been largely left to philologists, anthropologists and specialists in the field of cultural studies. The text shares the views that this conceptual history is an integral component of social history. The variety of available sources from the 16th to the 19th centuries contributes to the clear understanding that the terms are indicators of social change. The analysis begins with the first historiographical works produced at the end of the 18th and the beginning of the 19th centuries. These are various textbooks and materials from the periodicals, dictionaries and translations of Ottoman imperial edicts. Some examples from texts of the Bulgarian Enlighteners, which reveal the presence of the “legal theme” and the evolution of the legal terminology, are also presented. Special attention is attributed to the documentation accumulated in the course of the functioning of the urban municipalities and the esnaf institutions. On the basis of the analysis of the sources, it may be concluded that while different members of the intelligentsia made an effort to introduce Slavic terms in Bulgarian language, it was no doubt mainly a terminology strongly influenced by the official language in the Empire that was used at the level of contemporary practice. The analysis of the texts allows drawing conclusions about the low level of the legal culture of the Bulgarian society, the tenacity of tradition and continuity, the different obstacles to modernization, the role of various factors in the formation of this culture, and, in the first place, the role of the transfer of foreign systems in the process of maturing of Bulgarian society. Based on the archives of the Commissariat for Jewish Affairs, the paper examines three cases of the mandatory “ariazation” of the “Jewish” shares in domestic companies required by the Anti-Semitic laws enacted in 1941. The focus is on the specific segment of 56 enterprises which have been ultimately acquired by the State and which constituted well above 50% of the capital hold by Jewish shareholders. The cases under scrutiny reveal how intense was the interest of local capitalists to acquire the “Jewish” property subjected to compulsory sale. Many industrialists seized the opportunity to try to obtain at attractive price the assets offered. They demonstrated no scruple concerning the origin of the offer, while many of them showed overt allegiance to the Anti-Semitic policies. In the rush, however, the State had a privileged position. As the cases prove, the government had no difficulties to impose its will and to nationalize the firms it targeted. Thus, the racist legislation enhanced significantly the already powerful statist trend in the Bulgarian inter-war society. With the “ariazation” of the economy, the State handled and distributed discretionally a significant volume of ownership. Although seemingly paradoxical at first glance, a parallel is made with the problems and the technicalities that emerged during the recent privatization in Bulgaria which constituted an even more important exercise of property redistribution. The paper is a sociological attempt at a normative analysis of the penalty system codified in the key laws from the Liberation (1878) up to present days. The task is to explore the time dynamics and the relative weight of the punishment “deprivation of rights” within the framework of the Bulgarian juridical rationality. Hence, the analytical problem refers to the necessity of building a correlative history of crimes and rights, a framework targeted at conceptualizing the specific regime of their social functioning. In this work, I proceed into a comparison between the patterns of managing ethnic relations in Serbia and Croatia within the context of European integration. My main objective is to clarify: a) how Serbian and Croatian minority legislations compare to each other and to European standards; b) the situation with the collective statuses of ethnic Serbs in Croatia and ethnic Croats in Serbia in the light of the ‘European aspirations’ of their “external homelands.” Attention is paid to regionalized mediums for the management of ethnic relations. This touches upon institutional provisions under the umbrella of the provincial autonomy for Vojvodina (Serbia) and certain bodies operating in ethnically mixed Croatian regions (e.g., Istria). One of this work’s additional objectives is to clarify how Serbian and Croatian legal experts have made proper use of selected elements from the Communist era legislation. What I demonstrate is that: a) both Serbia and Croatia have made significant progress in harmonizing their legislations with European standards; b) regionalized mediums have been articulated to a more satisfactory extent in Serbia. The famous phrase “If there is no bread, let them eat pastries (brioche)”, ascribed to Marie Antoinette, the wife of King Louis XVI, is perceived as an incarnation of the superior and arrogant attitude of the French elite towards common people at the eve of the French Revolution in 1789. The paper disputes the historical truth of this statement, referring to Rousseau’s Confessions. Its main focus however is not the search of the historical truth, but the contextual interpretation of the phrase, keeping in mind the cultural history of food and philosophical-ideological arguments for linking different types of food to the status of various social groups in that period. In light of such interpretation, the phrase about bread and pastries acquires a new revolutionary meaning related to the ideas of equality and equal rights, to the struggle against status privileges, being an expression of the spirit of the French Revolution. The article is mapping out two most recent research projects on nationalism held by the Southeast European Academic League. The first one is “Facing the Challenges of Nationalism” (2007-2008) and the second is “Eurointegration and nationalism on microlevel” (2009-2010), funded by the CEE Trust for Civil Society and the Open Society Institute. Their 34 case studies cover a wide range of individual or group actors (ranging from official institutions, political parties and organizations to patriotic intellectual circles or lobby groups, media, NGOs, market agents, informal youth groups as well as internet forums, sites and portals), all of them involved in emblematic or hybrid forms of nationalistic propaganda or “patriotic” acts. Their shared hypothesis starts with the observation that, due to the specific political balance between ethnic and religious groups (but also due to a lack of real innovative vision), the state has abdicated from its traditional function to provide a coherent cultural and educational policy in the area of patriotism. As a reaction, Bulgarian nationalism has been privatized by different individual, collective and institutional actors (mostly EU opponents). There is an alarming variety of patriotic groups, societies of radical historiographers, military unions, populist political parties, TV talk shows, soccer fan clubs, Diaspora organizations, Internet forums, etc., which have produced an eclectic landscape. The process can be described as “privatization” of nationalism not fitting in any classical homogenizing description. Moreover, even when declaratively sharing a group or even an organization, their members, put under deeper research, show quite contradictory imaginations, myths, rhetoric and visions when referring to the nation. In this situation, the local elites appear too weak to construct the community transferring their duty to transnational European elites. Being very unskillful in this new and simply mediatory role and torn between cosmopolitan and domestic nationalistic ideology, they uncritically allow deeply contradictory or parallel messages from the highest legislative level to their PR actions. “Decentering” most institutional levels, the effect spreads with exceptional power in the educational sphere and the second project is very much focused on this. Contrary to classic expectations, the projects show exactly how nationalism is not disappearing, but is proliferating in new hybrid, reactive or unstructured and fluid unknown versions. This paper aims to present the interdisciplinary research project “Emotional contentof Bulgarian national identity…” The goal of the project is to examine the emotional content of Bulgarian national identity from different perspectives – historical, sociocultural and socio-psychological. It investigates the importance of group emotion (e.g. admiration, pride, shame, fear, (in)security, etc.) as a product (and generator) of social identity and social context, and as a mediator of social action and political participation. Participants in the project apply an integration of social identity theory (together with its developments), and of intergroup emotion theory. Their main objectives are: 1) to identify the emotional components of the Bulgarian national identity and how they relate to other key identities (personal, gender, religious, etc.) as well as to the process of European integration; 2) to explore how the international comparative context affects both the character of the collective emotions and the salience of the national identities; 3) to investigate how the audience to which identity is being exposed affects both the character of the collective emotions and the salience of the national identities; 4) to demonstrate whether it is possible to deliberately produce certain shifts in some of the emotional components of the (Bulgarian) national identity; 5) to investigate the interdependence between the occurrence in the society of internal (semi)structural cleavages and the strength and emotional “colouring” of the national identity. The defined objectives are realized by two types of activities: a) explorative work: text materials investigation (archives, text books, literature) and field studies; b) seminars, workshops and international conference. This text is a review of an online English-language journal Journal of Social Science Education (www.jsse.org, 1/ 2011). The main question which is posed by its articles is: What kind of political order has been legitimated by premised subjective categories within curriculum and learning process? Articles can be divided along the lines of authors’ attitudes – activist and/ or analytical – and also there is a difference based on the texts’ contexts – Europe, USA, Asia, etc. The analytical texts by means of discourse analysis from historical and comparative perspectives show how different national identities and nationalities are constructed. What is interesting to be seen from activist’s point of view is how the notion of “liberal state” is taken for granted. That is why interpretations of curriculum pass by rights and freedoms, on the other hand, learning process should simulate public sphere premising communicational equality. There is also a review of Martha Nussbaum’s book Not For Profit. 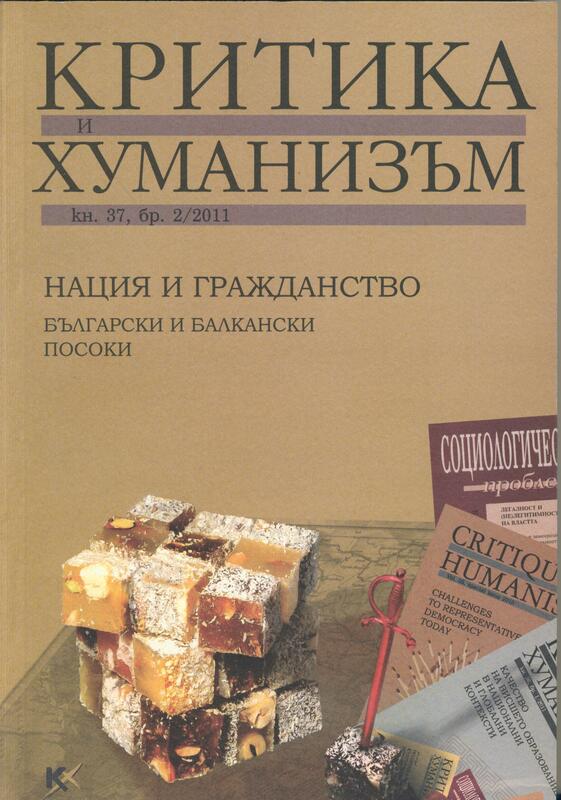 Why Democracy Needs the Humanities and tables which are translated into Bulgarian and published in the present issue of Critique and Humanism. The tables show different visions of citizen within different ideologies. This volume of Journal of Social Science Education gives a global perspective on educational problems in different parts of the world.